My name is Clancy and I found my new owner on March 17, 1999. Since I was brought home on St. Patrick's day, I was given an Irish name! I am now a healthy, happy and very active 3 year old who is "totally spoiled". I was around 6 months old when I was rescued from the street by Animal Welfare and brought to my new home on February 18, 1996. Although I had a rough start, I am now a contented and friendly indoor cat. 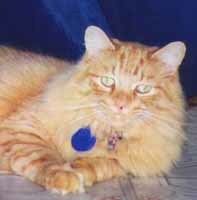 I love your web-site and the idea of pictures of the available cats. 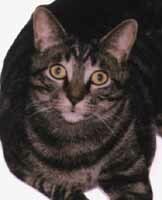 I have adopted 2 cats from Animal Welfare - Punk in 1996 and Clancy in 1999. After the experience of adopting the first cat, I have recommended Animal Welfare to many people ..... I think it is a wonderful organization. When I decided to get another cat in 1999, I called Animal Welfare and Clancy "found me" - he was exactly what I was looking for and has turned out to be a wonderful, energetic and interactive addition.